Why Buy from Our Father's Farm? Our Father's Farm has been promoting the most amazing super food in North America for over 17 years! Our very own Certified Organic Apricot Kernels are the most popular item and by far the most superior product on the market. We are more than just your online supply for organic products, more than advocators for healthy living, and more than an international business...we are first and foremost your local family farmers! We started as a small business out of the family home in 1999 and have grown exceedingly since then, yet we've maintained that small family business feel. 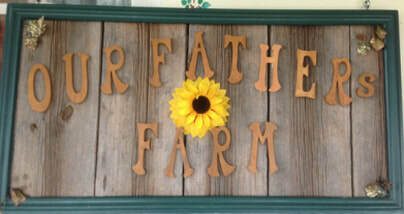 We still sell out of our home...come check out our farm store! If supporting family business isn't enough, another reason to buy from us is we guarantee quality, organically grown foods and products. We serve our customers the same chemical-free, high quality products we are serving our children. So be assured that we take organic, healthy living seriously! All of our kernels (almonds and apricots) are certified organic with Eco-Cert and CCOF. For those affected by cancer and other ailments, we offer high quality natural food to promote healing in the body. Certified organic apricot kernels have been used effectively by countless people for over 2 millennium. Apricot kernels are a great addition to ones diet. There are numerous health benefits which can be found by doing a search on the internet. Since we are not allowed to post claims our website, we must leave it up to you to research this incredible super-food, its benefits and how it has helped hundreds of thousands of people around the world. What is the difference between Bitter and Extremely Bitter kernels? The difference between the two varieties is the concentration of Vitamin B17 in each. The Extremely Bitter kernels come from a different variety of apricot and are much higher-quality and more highly concentrated with Vitamin B17 than the regular Bitter kernels. This is the reason for the price difference. The general trend we see is that people tend to buy the Bitter kernels for daily health maintenance and cancer prevention, and people who are fighting cancer or other diseases often purchase the Extremely Bitter kernels because of their potency. What do I need to know about the kernels? The seeds are full of Vitamin B17, which is a disease fighting agent. Many researchers have found them to be incredibly effective in treating and preventing cancer, but can certainly be beneficial for a number of medicinal purposes. There is approximately 4-5 mg of B17 in the average kernel. There are approximately 800 to 1000 kernels in a 1lb bag. A 150 lb. person might consume 1 bag of apricot kernels (approx. 900-1000 kernels in a bag) in about 2 or 2 1/2 months, depending of course on the habits of the consumer. The kernels we are currently shipping out are from our most recent harvest, and are fresh. The kernels will not 'expire' per se, rather they eventually lose their effectiveness. Keeping them in the freezer is best for a long shelf life if you have a large amount that you aren't going to use right away, but the fridge also works well. In fact, you can keep them in the fridge or freezer for over 10+ years. The best before date simply states the years of best potency. I can assure you that the kernels are freshly packaged as we do not keep any old stock. All of our orders are filled and sent the same week that we receive the order. no more than 3 per day, but those experiencing 'positive benefits' are taking well over that amount. For ourselves, we are comfortable taking approximately 5 per hour, and no more than 30 per day. Each person is very different, so find out what works for you! What is this I hear about soaking the kernels? We do recommend soaking the kernels. The reason for this is because all seeds have a natural coating of protection around them. Soaking the kernels in water safely breaks down the enzymes, allowing the body to digest and intake the nutrients more effectively. It is our belief that the soaking in fact enhances the medicinal benefits of the kernels, however there are others who may disagree with this. As always we encourage our customers to research these matters and find an answer that they are most comfortable with, due to the controversial nature of our products' benefits. We do suggest doing so for 6-8 hours or overnight. Then you can drink the water they were soaking in to get the full benefits. What are the Ground Apricot Kernels used for? Some people prefer to take the kernels in powder form for reasons such as convenience or for taste. The ground apricot kernels can be sprinkled over foods such as cereals or salads, added into sauces or mixed into smoothies. The ground kernels can be mixed in with other spices like cinnamon, oregano, or parsley. Some apply the powder to facial and body creams and use as an exfoliate to promote healthier, fresher skin. A recent trend in pet health has owners adding the health benefits of the apricot kernels to their pets’ diets. Some sprinkle the ground apricot kernels over their pet’s regular dish, while others give their animals the kernels in their entirety. How many apricot kernels in 1 teaspoon? In general, 1 teaspoon of ground apricot kernels is equal to 5 kernels. Can I give apricot kernels to my pet(s)? In addition to humans getting diagnosed with cancer at a rate of 1 in 2, there has also been a major increase in the amount of animals that are being diagnosed with cancer. More veterinarians are recommending pet owners to give their beloved cat or dog apricot kernels and/or ground powder form. Many pet owners have had great success with their animals in shrinking tumors and extending the life of their beloved pet. Health food stores can chose to store them in the fridge or on the shelf. However, the end-user should store apricot kernels in a fridge or freezer. How long will they keep in storage? They will generally keep between 6 to 8 months unrefrigerated, 2 – 8 years in the fridge, and 10 years + in the freezer. ​What is the return policy? (a restocking fee of 10% may apply).